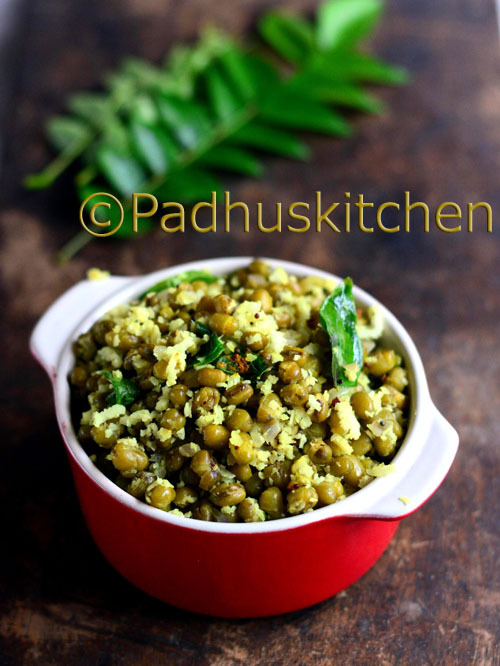 Payaru Thoran is a very simple dry curry made with green gram. It can be had as a side dish for rice kanji (porridge), rice and even as an evening snack. Today we will learn how to make Kerala Style Payaru Thoran following this easy recipe with step wise pictures. Wash and soak green gram overnight or for 5-6 hours. Pressure cook green gram with a little salt, a pinch of turmeric powder, adding less water, until soft but not mushy. I kept it in a vessel inside the cooker and pressure cooked for 3 whistles. You can also cook covered in a pan but will take a longer time. So now our cooked payaru/green gram is ready. We will do the seasoning. Heat coconut oil (for authentic Kerala taste) in a pan, add mustard seeds, when it splutters, add finely chopped onions, green chilli and curry leaves. Saute until onions turn transparent. Add grated coconut, turmeric powder, salt needed and saute for a few seconds. 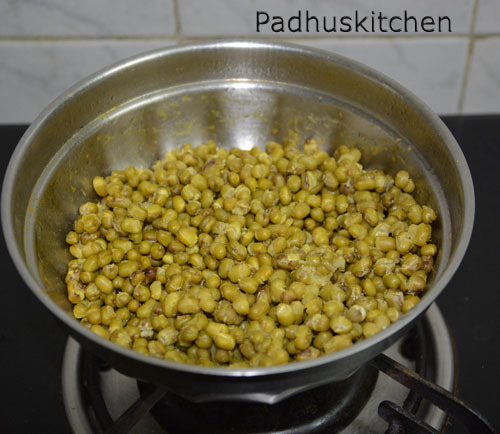 Add cooked green gram, pepper powder, mix well and cook for another 2 minutes. Enjoy it hot with rice kanji or as a side dish or as a tea time snack. Wanted to cook sth quick but healthy today. Was too tired to cut veggies and so checked the net for 'mung thoran'. When I saw ur recipe I decided to try it as ur pesarattu was a great hit with hubby n kids. This dish too turned out great . Thank u so much. Being a keralite, kanjiyum payarum is my favorite dish. I used to make it often.After seeing your post,I followed the same procedure. It came out more delicious. It's so delicious.. Thanks for the recipe. Garlic is missing ib ur cooking method.